One of our favorite architects, Santiago Calatrava, has just made design history, completing his first ever vehicular bridge in Dallas, Texas. The Margaret Hunt Hill Bridge, opening this weekend, will connect two banks of Dallas' Trinity River, revitalizing an amazing space at the heart of the city and creating a one of a kind outdoor recreational hub inspired by New York's Central Park. The Trinity River has five branches and flows through the entire state of Texas. Passing through major cities like Dallas and Fort Worth, the river is an iconic piece of the Lone Star State. From first sight, Calatrava saw this bridge project as an opportunity to not only connect pieces of the iconic city, but also to breathe new life into West Dallas, a neighborhood ridden with abandoned factories and industrial warehouses. While the striking bridge with its 400-foot arch is finished, plans for a recreational area at its feet are still in the works. Calatrava and planners aim for the bridge’s park to be a bustling public place and a new favorite stop for Dallas visitors and tourists. The Margaret Hunt Hill Bridge’s six traffic lanes are expected to carry nearly 14,000 drivers a day, undoubtedly breaking up some of monotonous commuter traffic jams that surround the city. Although the ribbon cutting ceremony is this weekend, Calatrava’s work is not nearly finished. 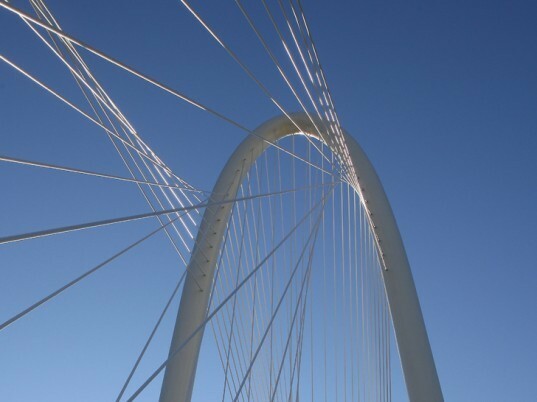 The Margaret Hunt Hill Bridge is only the first of a series of bridges designed by Calatrava to cross the Trinity River. A sister bridge aimed to replace the Interstate Highway 30 further along the bend is still in the design phase. That should be 42,000 vehicles a day. The Trinity River has five branches and flows through the entire state of Texas. Passing through major cities like Dallas and Fort Worth, the river is an iconic piece of the Lone Star State. From first sight, Calatrava saw this bridge project as an opportunity to not only connect pieces of the iconic city, but also to breathe new life into West Dallas, a neighborhood ridden with abandoned factories and industrial warehouses. While the striking bridge with its 400 foot arch is finished, plans for a recreational area at its feet are still in the works. Calatrava and planners aim for the bridge's park to be a bustling public place and a new favorite stop for Dallas visitors and tourists. The Margaret Hunt Hill Bridge's six traffic lanes are expected to carry nearly 14,000 drivers a day, undoubtedly breaking up some of monotonous commuter traffic jams that surround the city. Although the ribbon cutting ceremony is this weekend, Calatrava's work is not nearly finished. 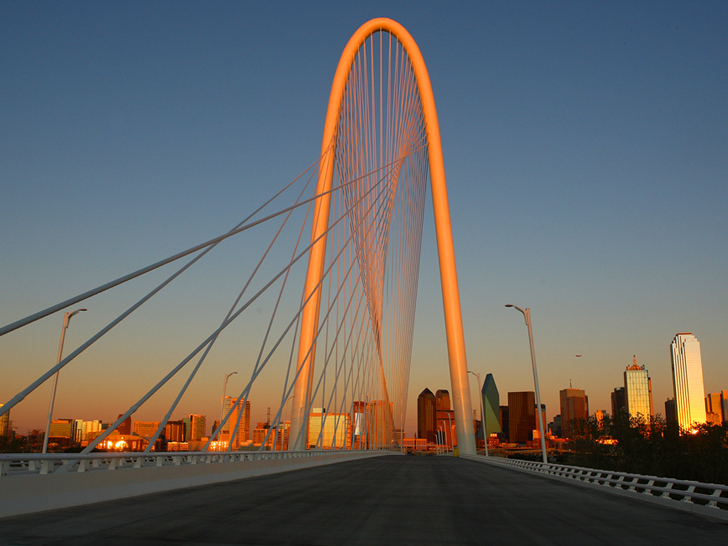 The Margaret Hunt Hill Bridge is only the first of a series of bridges designed by Calatrava to cross the Trinity River. A sister bridge aimed to replace the Interstate Highway 30 further along the bend is still in the design phase.